Sangamo Weston was a company that made light meters, among much other electrical equipment. It is particularly known for the Weston Master series of selenium meters. Weston was founded by chemist Edward Weston—no relation to the famous photographer—who held many patents for electrical inventions, from permanent magnets through cellulose manufacturing, dynamos, arc and filament lights and the magnetic-drag speedometer to electrical measurement instruments (and even US 895218 - a fruit box!). Weston's son, Edward Faraday Weston, applied for a U.S. patent on the first Weston exposure meter, granted as No.2016469 in October 1935. This was a cylindrical case with an electrical meter at one end, and an iris at the other; an adjustable scale around the meter opened and closed the iris, and showed the exposure. Sangamo was originally "Sangamo Electric Co.", in Springfield, Illinois. It set up a British subsidiary in 1921. Sangamo acquired the Weston Electrical Instrument Co. in 1936. Since Weston was one of the first makers of light meters, before film speeds were standardised, Weston had its own film speed scales. At some point, Weston products were distributed by Ilford in the UK. The company was bought out by Schlumberger in 1976, but still exists, making electrical timers. 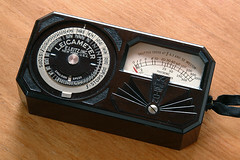 The EuroMaster light meter, very close to a Weston design, was later made by a company called Megatron. ↑ A short biography of Weston may be found here within the New Jersey Inventors Hall of Fame website, hosted by Stevens Institute of Technology. Wikipedia has a longer article about him. 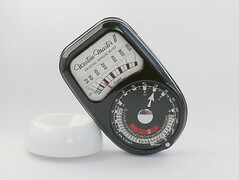 Several articles about Weston meters in James Ollinger's Exposure Meter Collection. This page was last edited on 8 June 2017, at 05:26.